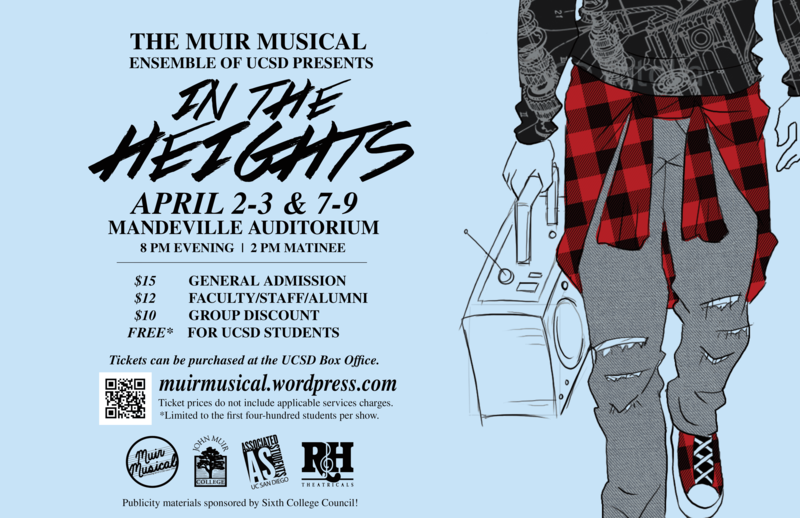 Muir Musical is back at it again — not just with the spotlights on the white Vans, but rap, hip-hop and the National Tour set of “In The Heights.” That’s right. The Muir Musical Ensemble of UCSD, partnered with A.S. Council, are staging the Tony Award-winning musical — music and lyrics by “Hamilton”’s Lin-Manuel Miranda and writer Quiara Alegria Hudes — set in Manhattan, New York. Washington Heights, to be exact, a Latin American suburb where narratives converge. Couple this ready-to-change neighborhood with a winning lottery ticket and some musical numbers — from hip-hop to salsa! — and you’re ready to have a rockin’, dance-filled summer in New York. Let’s rewind: the National Tour set? You’re correct. Go ahead. Pull up a smartphone and Bing! away at the search bar — that low-resolution suddenly becomes real-life resolution when the curtains part and that set is waiting there for you, in all of its glory. Seriously, that set is a beauty to behold; it took nearly a week to construct all of it. The details are meticulous down to the shelves, the brick walls and even the Washington Bridge. All of this is done in wonderful synergy for that picturesque National Geographic, nature documentary — except, well, this is Theatre. If, for some reason, you’ve accustomed yourself to the post-class rush and are an avid consumer of buying your seats at the very last minute, you might want to hurry over to the UCSD Box Office. Tickets are free for UCSD students, and the weatherman and resident astrologist predict they could run dry very quickly, so grab your tickets at the UCSD Box Office today.